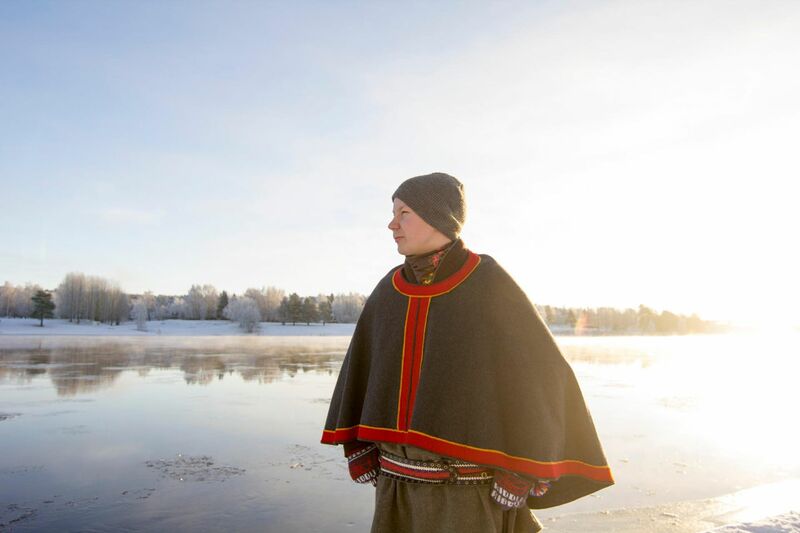 Sámi poet and musician Niillas Holmberg, 27, stands on the front line as a spokesman for Sámi and indigenous peoples’ rights to self-determination. The artist treasures the nature and peace which he finds in Sámiland. He wants to live in Sámiland, the source of his creativity. Sámi artist Niillas Holmberg was born in Ohcejohka, Utsjoki in Finland. His relatives live on both sides of Tenojoki river, in Norway and in Finland. Above all, however, they live in in Sámiland, the region that includes northern parts of Norway, Sweden, Finland and Russia. – I’m not an artist from Lapland, I’m an artist from Sámiland, Sápmi. My identity is neither Lappish nor Finnish. It’s not a criticism against Lapland or Finland; it’s just not part of me, says Holmberg. This is an essential thing in the works of Niillas Holmberg. He has published five books of poetry and performs with four bands. In his art, he treasures Sámiland, the Sámi language and traditional Sámi culture. From his perspective, the traditional Sámi worldview rarely goes together with the western world’s values like individualism and competitiveness. – In the traditional Sámi worldview, one does not think only of himself but also the next seven generations, explains Holmberg. For example, in the use of natural resources, there’s a big difference between Sámi and western actions. The Sámi worldview encourages a balance in nature, but moderation hardly goes hand in hand with capitalism. This is an example of the contradictions Holmberg processes in his art. In Holmberg’s family, it was important to emphasize Sámi identity. Later Niillas found his own way to make an impact – through his art. – I was never an entertainer, and I’ve always wanted to speak out on Sámi issues, even before I became an artist and a kind of public character, he says. Holmberg criticizes state institutions and politicians for not taking actions on Sámi issues. Therefore he thinks it’s very important to educate people, especially through art. – Art is a vessel to uncharted territory within a person. Holmberg recently moved back to his native Utsjoki. For a performing artist, living in Finland’s northernmost town means lots of traveling, but the Sámi poet wants to stay in Sámiland, where he feels at home. – My art stems from my land and my culture. I cherish the calmness I find living in the north. Niillas Holmberg’s next book of poetry covers politics and issues that concern not only the Sámi but other indigenous peoples as well. – Nils-Aslak Valkeapää was one of the first who highlighted brother- and sisterhood between indigenous peoples around the world – we have the same problems with the western world’s values, says Holmberg. who get grammar from biology. prove that every word is an adjective. Look to the flowering meadow, the strategy.